In 2001 we decided to lift a lot of rules and a massive amount of resource extraction went into place in a very short time span. This was done with the privatization of regulation (deregulation). We thought that the capital markets would be enough to oversee this massive change in our resources and handle the risk appropriately, and we did it in a really short amount of time. Instead of an eternal problem facing human society, it’s about a small group getting power in the White House and shredding the laws, oversight and process concerning how our environment and private companies interact, no doubt making themselves rich in the process. Less Icarus, more Cheney. What does this hold for the future? Notice that the regulators were put into crony sleep mode exactly at the moment where they were most needed. Obviously some of that happened. But the primary shape of this story is pretty obvious. When oil prices skyrocketed following the OPEC embargoes of the 70s, investment in oil exploration went up. When oil prices crashed in the 80s, investment went down. When they skyrocketed again in the aughts, investment went up. Bush/Cheney policies obviously helped, but this is mostly a pretty simple market reaction to high prices. And the future? I’d count on that blue line continuing to rise. It will certainly have rattles and bumps along the way, but the era of cheap oil is over, and permanently high prices make even expensive investment in hard-to-extract oil worthwhile. 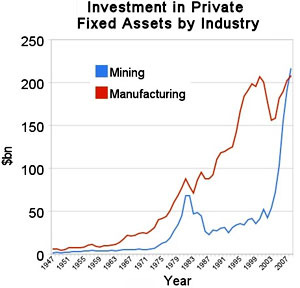 The final fate of American manufacturing is still unclear, but I doubt that it will ever match resource extraction again.